After iOS 12.1.2 update iPhone users are not facing issue that the microphone is not woking after upgrade in iPhone. iPhone microphone does not work with iOS 12.1.2 and other user cannot hear anyone when they calls, cannot use Siri and cannot use talk to text. This is clearly an issue withiPhone microphone after iOS 12.1 upgrade as when tried to record a voice memo in voice memos, it says “no audio device found”. This is irritating as the iPhone microphone was working just fine before the update. 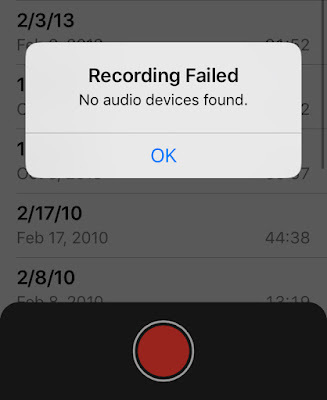 This not only issue but due to microphone not working in iOS 12.1.2, Siri no longer works, dictation only works via bluetooth or headset with mic, no FaceTime call and front video will record but only records sound if connected to headset with mic. The only workaround to call someone is to use headset or Bluetooth in the car. “Then updated to ios 12.1 - microphone wouldn't work, couldn't take calls/put phone on speaker, and plugged in headphones won't work, Bluetooth headphones work with calls and everything. Spoke to an apple help person online - they advised to reinstall my phone with icloud, bought extra storage and still, I reinstalled and the problem was kind of fixed, phone call worked, then later on it was glitchy and the next time I tried to call after an hour of fixing it, it went back to the issue, I'm 100% sure it is the update because it was perfect before then. I've since tried everything, Resetting the settings, network, and the whole phone. To make microphone working you can try to reset the iPhone to original setting. Take a backup using iTunes on computer, then reset your iPhone goto Settings / General / Reset All Settings. Some users reports that after trying to completely reset my phone back to factor settings using 12.1.2, the phone worked few calls and it went back to not working again. According to some of Apple support, microphone issue is a software problem so a reparation would be good option but a lot of people have this problem so I say it was a software problem (ios 12) and this problem caused a hardware problem. So to fix the issue Apple must be working on this and possibly next iOS update should address this issue.